Back in 1933 when the first ever Zippo pocket lighter went on sale, Zippo introduced their lifetime guarantee and have stood by their promise ever since. It is a true lifetime guarantee with no strings attached (although it doesn't cover cosmetic wear and tear - ie. scratches, scuffs and overall appearance). If you have a genuine Zippo pocket windproof lighter which fails mechanically, breaks down or won't light for mechanical reasons, Zippo state that if you send it to them then they will return it to first class mechanical working condition, regardless of the age of the lighter - whether it be 1 year old or 60 years old. 3-year warranty: Zippo warrants its Multi-Purpose Lighters and Utility Lighters for 3 years. The finish is not warranted. Any Zippo Multi-Purpose Lighter or Utility Lighter returned for warranty repair within 3 years of purchase will be repaired free of charge, or replaced with the same or a similar product, at Zippo's discretion. Damage to the Multi-Purpose Lighter or Utility Lighter resulting from abuse or misuse is not covered by the Zippo warranty. Sender must also provide proof of purchase. 3-year warranty: Zippo warrants its Candle Lighters for 3 years. The finish is not warranted. 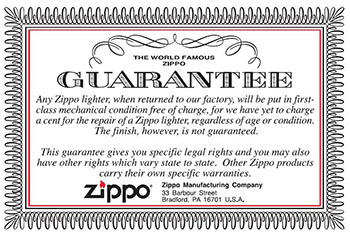 Any Zippo Candle Lighter returned for warranty repair within 3 years of purchase will be repaired free of charge, or replaced with the same or a similar product, at Zippo's discretion. Damage to the Candle Lighter resulting from abuse or misuse is not covered by the Zippo warranty. Sender must also provide proof of purchase. 2-year warranty: Zippo warrants its pens for up to 2 years. The finish and refill are not warranted. Any Zippo pens returned for warranty repair within 2 years of purchase will be repaired free of charge, or replaced with the same or a similar product, at Zippo's discretion. Damage to the pens resulting from abuse or misuse is not covered by the Zippo warranty. Sender must also provide proof of purchase. 2-year warranty: Zippo warrants its Hand Warmers for up to 2 years. The finish and burner units are not warranted. Any Zippo Hand Warmer returned for warranty repair within 2 years of purchase will be repaired free of charge, or replaced with the same or a similar product, at Zippo's discretion. Damage to the Hand Warmer resulting from abuse or misuse is not covered by the Zippo warranty. Sender must also provide proof of purchase. 2-year warranty: Zippo warrants its Watches for up to 2 years. During the warranty period, the case and metal strap, watch movement, hands and dial are the only components covered under this warranty. These will be repaired or the watch will be replaced with the same or similar product, at the sole discretion of Zippo, free of repair charges. This warranty does not cover the battery, crystal, non-metal strap or bracelet, incidents of normal wear and tear (including but not limited to scratches or other damage to the finish), incidents of abuse, or water damage unless the watch is marked as waterproof and the watch was used as instructed when the damage occurred. Sender must also provide proof of purchase. 1-year warranty: Zippo warrants its Fire starters for up to 1 year. The finish and internal unit are not warranted. Any Zippo Fire Starter returned for warranty repair within 1 year of purchase will be repaired free of charge, or replaced with the same or a similar product, at Zippo's discretion. Damage to the Fire Starter resulting from abuse or misuse is not covered by the Zippo warranty. Sender must also provide proof of purchase.